Benson Photos began taking walking pictures in Bridlington in the post-War years. They were operating by 1954 and were still in business in 1965, though the latest dated walkie by them I have seen in from 1964. Benson’s set up in competition to Bridlington’s long established photographic studio and walkie picture operator, Snaps. Snaps, who began taking walkies in the 1920s, had moved to smaller 2″ X 3″ walkie prints by 1950. These had the town name, year and ‘Snaps’ on the front, and the format was copied by Benson’s. Benson’s had a shop on 8 Bridge Street (shown today above, next to the side of the Brunswick Hotel), which is also where their developing and printing was carried out. It was run by Robert Owen, who was also a Bridlington councillor. The origins of the firm’s name are unknown. Benson’s walking pictures were taken on the beach on the North Bay by Victoria Terrace, then also on the South Bay promenade below the Monarch Hotel. A 1964 photo shows ‘Benson’s No. 2 Kiosk’ on the North Bay seafront in a building rented from the council. The older Bensons prints are approximately 2″ by 3″ and stamped on the back with the company information. Some also had the name Bridlington printed on the front, as in the example below. On visiting the kiosk, the customer received three identical prints 2/6d. Alfred, Rose, Patricia and Edward Bagshaw, on holiday from Sheffield, and walking on Bridlington North Bay promenade around 1955. Courtesy Edward Bagshaw. Benson’s later prints were square, approx. 3″ by 3″, probably done on an automatic print processor machine. These lacked the back stamp, and just carried the name Bridlington and the year on the front as in the example below. Rose Bagshaw from Sheffield on holiday in Bridlington in 1963. Courtesy Edward Bagshaw. Graham Williams worked for Bensons in the early Sixties, starting as a runner, collecting the exposed reels from photographers, and getting the finished prints to the kiosks. He later worked in the darkroom, and then became a cameraman. Mike also took photographs of holiday-makers in the pubs at night, and these prints could also be collected the next day from one of the kiosks. He used a Kodak Retina 1a camera for his walkie work. At that time Frank McMahon was another of the photographers, and Paul Eldred worked in the processing department. Benson’s staff wore a red cotton jacket with the name Bensons printed across the shoulders in yellow. “It was great way to enjoy the sun, meet girls and earn some money,” recalls Mike. Benson’s also diversified into the keyring viewers. Photographers used colour slide film. Once developed the frames were cut up and inserted into small viewers fixed to a chain and keyring clasp. The advantage of these was if the customer didn’t turn up to buy them, the slide could be removed and another put in. Graham Williams remembers them being very popular. Benson’s also opened in Scarborough for a time. They were certainly taking walkies there by 1956. These were a similar 2″ by 3″ format to the Bridlington prints (see example below), and usually had the company information rubber stamped on the back. Their address was 17a Sandside, down near the harbour (somewhere in the block now operating as Sideside Penny Arcade, see photo above.) I do not know how long they operated for. Mr and Mrs W. Milner, on their honeymoon. Taken by Benson’s on Monday June 18th 1956, Scarborough old harbour. 32 Sandside was the nearby location of a pre-war Walking picture firm (which was still operating in 1946), but their prints are not marked. Please get in touch if you know any more about Benson’s or their walkies. Another example of a Benson’s print can be seen on this page on the site. (My thanks to Mike and Graham. 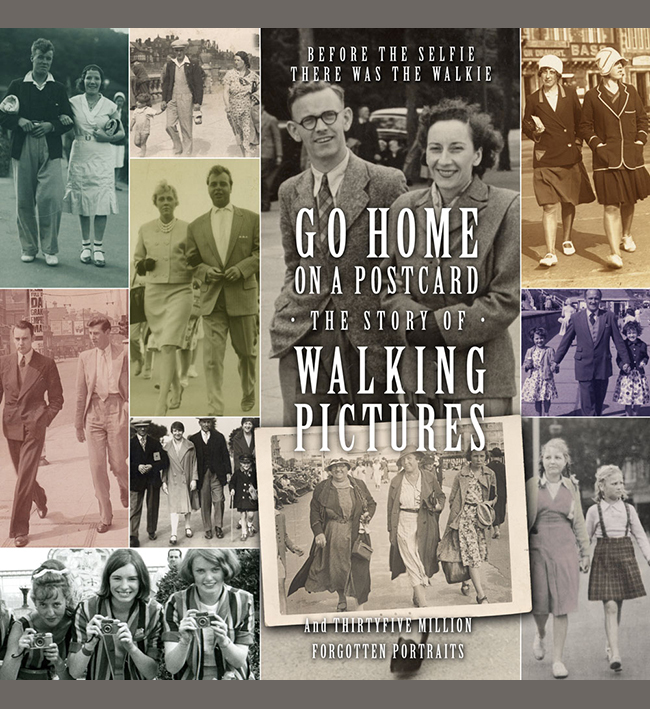 The story of walking pictures is told in the book Go Home On A Postcard).